Global developments – particularly the increasing deterioration of the environment andgrowing threats of environmental disasters; growing demands by increasing mature and informed consumers for more responsible products and services; as well as key positive actions undertaken by governments and businesses – suggest that sustainable tourism is not a luxury item on the agenda, but a growing necessity for the travel and tourism industry. At the sametime, there is a growing body of knowledge and experiences regarding the implementation and best practices of sustainable tourism. But how is tourism developed in a sustainable and responsible manner? What can we learn from the experiences and pitfalls of others in the industry as well as others from other industries that have gotten it right? Drawing on the experiences of companies and countries all over the world – those that have done it right from the beginning such as Costa Rica and the Commonwealth of Dominica and the challenges that they continue to face; those that were forced by their circumstances to develop responsible tourism (South Africa) to those that have destroyed and have now rescued their natural and cultural resources such as the Rhine River in Germany. 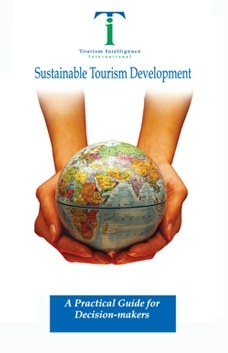 This volume is a valuable resource for practitioners in the travel and tourism sector. Whether you manage a destination or property; whether your operation is in the mountains, on the coast or inland; whether you belong to the private or public sector, Tourism Intelligence International’s exhaustive and insightful report on sustainable tourism development will provide a practical solution and guide to making sustainability a reality. The report will certainly be an eye-opener for all those interested in growing their businesses and destinations in a sustainable manner.